We all use mirrors. In fact we use them several times a day. First thing in the morning when we get up and are brushing our teeth.We are looking at out teeth and noticing everything about them. Usually we are thinking about the bad things. Maybe we think they are too yellow and need a good professional cleaning. Although who really wants to subject themselves to the dentist. As our day progresses we use the mirror to fix our hair as well as to apply makeup.In the process of doing all of these things,we see all of our flaws. 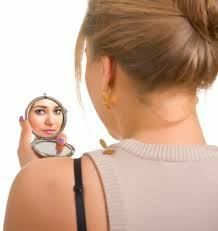 Did you ever notice that you actually you come move closer to the mirror in order to get an especially closer look at that pimple you recently acquired? You probably think that you come into contact with can see that pimple from twenty feet away. The reality is that most people you come into contact with see you as you would appear to yourself at a distance of two feet. That means unless you invade someone’s personal space and point out the pimple to them they will not know the difference. People who meet you for the first time or even your closest friends will not know that you have a blemish unless you go out of your way to bring it their attention. Isn’t this amazing news? It really is amazing news as well as food for thought. Because what we all have a tendency to do is to internalize those flaws. We operate in a manner that assumes everyone can see our flaws. As though there was a red arrow pointing to them. This in part will inhibit our ability to be effective in anything we are undertaking at this moment. By realizing that our flaws are not readily apparent to everyone we cross paths with, it will change the way we conduct our daily business. Without concerning ourselves with what others cannot see, we will walk taller and speak more assertively. Our power will come from a confidence that who we are and what we have to say is important and relevant to all. When you look in the mirror and you see those things that appear as flaws, know they are yours alone to deal with!